I enjoy watching documentaries about fitness and nutrition. 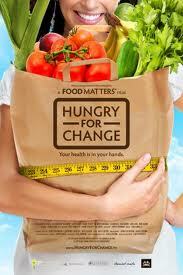 I recently saw Hungry For Change and I thought it was one of the more entertaining films I have seen about how to improve your health. This movie highlights the problems with the average American diet and tells how most of us over eat yet are under nourished. There is not one particular star or celebrity in this movie, but it features over 10 health and nutrition experts and their thoughts on the subject of nutrition. They all seemed to agree that people consume too many processed foods and they suggest we eat less sugar, high fructose corn syrup, MSG, aspartame, and junk food. One reason I liked this movie is because it provides simple solutions. They all promoted a basic common sense approach to improve our health by making better food choices. Their solutions include eating more vegetables and fruits with the idea that if we introduce more healthy food into our diet it will crowd out much of the addictive junk food and empty calories that we frequently consume. One concern I had was that mid way through the program it felt like it was turning into an infomercial for juicing. That would usually bother me more if there was one particular product or diet they were specifically trying to get the viewer to follow, but they only promoted basic principles so it was not like they had an agenda to sell us on any specific product. I may not have agreed with everything that was said in this film but I still think people would be healthier by following the ideas they presented and their messages are worth hearing. The movie also emphasizes the importance of stress control, exercise, visualization, and self acceptance which I thought was helpful since these things are frequently over looked by some people who are trying to lose weight. Hungry For Change does not talk about how to drop 10 pounds fast or lose inches, but rather it takes a more meaningful inside out approach and focuses on taking care of your body and living a healthier life so those external benefits can happen down the road. I give Hungry For Change 7.6 stars and suggest it for anyone who is looking to improve their dietary habits and live a healthier life.